The Voi Municipal Water Pump House 03 is a GWC Trans-African Pipelines municipal pumping station approximately 17 kilometers away from the industrial town of Voi, Kenya, located near the UNSC military base Crow's Nest. It is a part of the continent-wide pipe system that starts at water purification facilities near Mount Kilimanjaro, and is one of the pump houses responsible for Voi's water supply. The Tsavo Highway runs through the lower part of the building, and it has a chain-link gate that can be used to close down the highway. A highway tunnel entrance with heavy blast doors is also located nearby. Before the onset of the Battle of Earth, there was apparently a maintenance or construction operation in progress in the immediate vicinity of the pump house, as two subterranean pipes diverging from the main pipeline had been unearthed, some of them haphazardly covered with plates of grating. During the Covenant's prolonged invasion of Earth, the Prophet of Truth's Jiralhanae-led forces guarding the perimeter of the excavation of the Portal established an outpost near the pump house in order to keep any human forces at bay. 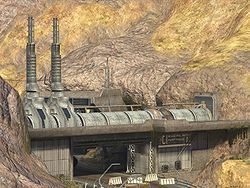 On November 17, 2552, the pump house became the site of an engagement as UNSC forces pushed toward Voi after abandoning Crow's Nest. During the skirmish, the Covenant forces engaged several squads of Marines in the area, prompting an intervention by John-117 as he advanced on Voi. The humans eventually broke the siege and advanced onwards, regaining control of the pump house. Alternate view of the building. Pipes leading away from the pump house. Two UNSC Marines defending the pump house.